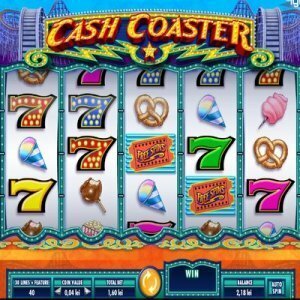 [miau] Avoid the crowds and the travel expense and instead, fire up the computer and play the online slot machine game, Cash Coaster, for a real thrill. This colorful new online slot game has 5 reels and 30 pay lines that are fashioned after a theme park. The symbols include all the great things you would find an amusement park, including: candied applies, snow cones, popcorn, pretzels and other wildly bright symbols. Keep an out for the colored 7’s because when you see a combination of 5 sevens, expect to win. It is easy and fun to play Cash Coaster. First you get your ticket stamped which will determine your betting level and then simply click the big YELLOW button to trigger the fun! The reels will start spinning and the excitement, of a potentially large payout, builds. The Cash Coaster online slot machine game offers players some unique and fun features. Get ready for a wild ride! At any time during gameplay, you may see a roller coaster cars roll over a reel (or two) and the excitement will begin. When you land on three (or more) of the colorful “scatter” symbols (also known as the Free Spin Ticket), you will be awarded with up to six free spins which can increase your cash payout by 30 times the original bet. When the free spin feature is activated, you will be given an option to choose from several colorful ticket booths and this choice will reveal how many FREE spins you have won. Reels ONE and FIVE remain wild during the free spin process which increases your winning potential. In addition, more FREE spins can be gained during this wild spinning process. During gameplay, reel one and five will become wild and this great feature provides players with powerful winning potential. Even if you don’t hit the FREE spin feature right away, these wild reels can provide players with big wins. Cash Coaster is an outstanding online slot game to play. You can try it for free, but you will be plucking down real money soon to get your share of the frequent payouts. Don’t be fooled by the basic design because once the reels start spinning, the lights blink and the Cash Coaster sign dazzles throughout the game as well as a grand roller coaster zooming in the background. To increase payouts, Cash Coaster, pays whether the winning line appears right to left or vice versa. Cash Coaster is the type of slot game that is not only entertaining, but it attracts high risk players that are looking for a big jackpot!